The battle simmered for a long time, but came to a head when the pope sent a legation to Constantinople in 1054 over the fact that in 1053 the patriarch of Constantinople, Michael Cerularius, had ordered the closure of all Latin churches in Constantinople. The legation had many orders, but the principle one was to demand that Cerularius recognize the pope as supreme head of the church. 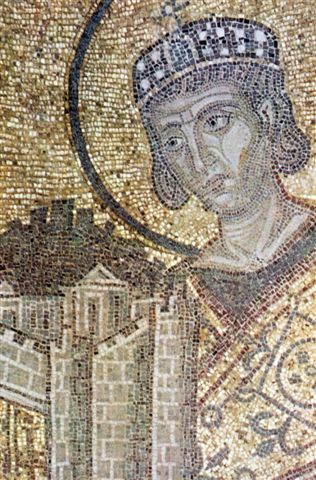 Humbert made the demand of Cerularius, and when Cerularius refused, Humbert laid a papal bull of excommunication of Cerularius on the high altar of Hagia Sophia, the cathedral that was the seat of the Patriarchate of Constantinople (akin to St Peter’s in Rome). The date was 16 July 1054. Given that the pope who wrote the bull (Leo IX) had died whilst Humbert was en route, its validity is questionable. But that scarcely matters any more. Humbert had apparently excommunicated Cerularius, so Cerularius, in turn, excommunicated Humbert. Let battle commence. It took 100 years of councils, formal communications, and whatnot for the split to be complete and irreconcilable, but this face off between Humbert and Cerularius was the symbolic first act in the schism. 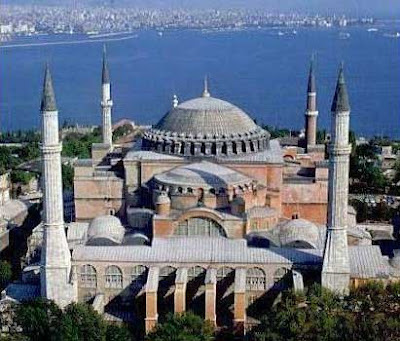 The cathedral where this all took place, Hagia Sophia (“Holy Wisdom” in Greek), is one of the wonders of the world. It is located in Istanbul (originally Constantinople). Hagia Sophia is famous in particular for its massive dome. It is considered the epitome of Byzantine architecture and is said to have “changed the history of architecture.” It remained the world’s largest cathedral for nearly a thousand years thereafter, until Seville Cathedral was completed in 1520. The current building was originally constructed as a church between 532 and 537 on the orders of the Byzantine Emperor Justinian, and was the third Church of the Holy Wisdom to occupy the site, the previous two having both been destroyed by rioters. It was designed by the Greek scientists Isidore of Miletus, a physicist, and Anthemius of Tralles, a mathematician. The construction of Hagia Sophia is described in On Buildings by the Byzantine historian Procopius. The emperor had material brought from all over the empire – such as Hellenistic columns from the Temple of Artemis at Ephesus, large stones from quarries in porphyry from Egypt, green marble from Thessaly, black stone from the Bosporus region, and yellow stone from Syria. More than ten thousand people were employed. The emperor, together with the Patriarch Menas, inaugurated the new basilica in 537 – amazingly, only 5 years from start to finish. That’s the mere blink of an eye when it comes to medieval construction. For example, the Duomo in Florence was begun in 1296 and not completed structurally until 1436. There are no surviving recipes from the Byzantine era although there are descriptions of the types of things people ate. In any case, even if I had one it would do no good because several of the main seasonings, such as the sauce called garos, are no longer available. So instead, here is one of my favorite Turkish recipes, Dü?ün Çorbas?. After all, Turkish (and Greek) cuisine is the descendant of Byzantine cuisine, with a lot of other cultures thrown into the pot for good measure. Dü?ün Çorbas? 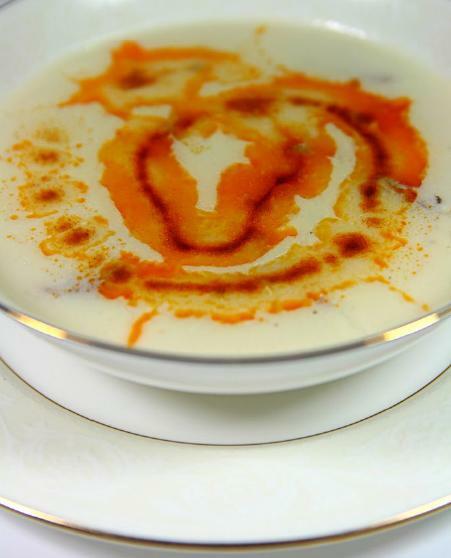 is a lamb soup that is customarily served at weddings. There it is served in small quantities, but it makes a good hearty lunch in big bowls. I think the most flavorful version is made with lamb neck, but you can use breast or shoulder. I make this soup over the course of two days because the best way to get the lamb fat out of the broth is to refrigerate it overnight. In the morning it has all risen to the top in flat, hard sheets that are easily removed. All soups are better on the second day anyway. Put the lamb neck or cubed lamb stew meat into a large pot with the water. Peel and quarter the onion; peel and cut the carrot into big chunks, and put them into the pot. Add around 1 tablespoon of salt or to taste. Simmer, covered, over very low heat for 3 to 4 hours, or until the meat falls from the bones. During the simmering process skim the broth frequently. If you are using lamb neck bones, remove them and strip the meat from them, shred it with your fingers and reserve. Discard the bones. If your meat is boneless, simply shred it and reserve. Discard the onion and carrot. Strain the broth. Return the meat to the broth and refrigerate overnight. Melt the butter in a large, heavy pot over medium heat. Stir in the flour to make a roux, and brown lightly. Stir in the soup, a little at a time at first. I use a whisk for this step. Your goal is to avoid lumps by working gradually. When the soup and roux are combined, bring it to a simmer and cook for 3 to 5 minutes or until the soup is slightly thickened. Beat the egg yolks and lemon juice together in a heatproof bowl. Spoon in a ladleful of hot soup a little at a time, whisking as you do, then stir this mixture into soup. Very gently heat the soup until it is ready to simmer. Do not let it boil. Meanwhile, for garnish, cream together the butter and paprika and add a dash of cayenne. Spoon the soup into bowls . Top with the creamed butter and paprika. Serves 6 as a meal, or 8 to 10 as a first course.